Before we run the analysis we need to discuss an anomaly with the dataset that has been built over many years. The dataset is calculated using data published by the Reserve Bank of Australia. I show a screen grab of this data below. Reading this table I have always assumed that the columns “Dividend yield per cent per annum” and “Price/Earnings ratio” referred to the ASX200. It turns out that this was a bad assumption and this month I have noticed some small print that highlights that these two columns actually refer to the MSCI Australia Index with all other columns being the ASX200. This to me is just bizarre but if we want to continue with this dataset it looks like I am going to have to think outside the box as I’ve tried searching for new data that details the P/E and Dividend Yield of the ASX200 and not surprisingly drawn a blank. Let’s therefore firstly have a look at the differences between the two indices. It turns out there is a lot of commonality. Both are float adjusted, both are market cap weighted, both have similar market coverage (the ASX200 at 83% and the MSCI Australia 200 at 84%) and both rebalance quarterly. The difference seems to be that the ASX200 allows foreign securities listed on the ASX where the MSCI Australia doesn’t. An obvious gap will therefore be News Corporation as its domicile is now the United States but some cross-listed Newscorp securities remain on the ASX. This similarity means it is worth looking further. The next stop to then have a look at the securities held and the percentage of each holding for each index. Unable to freely find the holdings for each Index required some creative searching which yielded the holdings for 2 ETF’s which look to replicate each of these indices – the SPDR S&P/ASX200 Fund (STW) and the iShares MSCI Australia 200 Fund (IOZ). Running a Pareto of the holdings and show these in the chart below. As mentioned above it can be seen that NewsCorp (NWS) is missing from the iShares MSCI Australia where in the SPDR ASX200 it constitutes 0.67% of the fund. Oil Search Limited (OSH) is another obvious gap. The iShares MSCI Australia doesn’t hold it where in the SPDR ASX200 it constitutes 0.73% of the fund. The SPDR includes 1.58% of a constituent listed as NA. This is not actually a company but is a Futures Contract which I assume the SPDR ETF is using to help with index tracking. This I think can therefore be ignored as an anomaly as it won’t appear in the real index and would simply be spread amongst the other companies. Given that NWS and OSH only constitute a little over 2% of the total funds and the remaining securities are all carried in similar weightings I am going to hypothesise that it is highly likely that the P/E Ratio and the Dividend Yields for each Index will be close. To further validate this hypothesis I would have liked to get a current Dividend Yield and P/E Ratio for each index on the same day. An extensive web trawl yielded nothing however I did manage to find a further piece of data that helps with the validation. This is shown in the table below and is the 1, 3 and 5 year Index (not the ETF’s but the real Indices) Total Return for the MSCi Australia and the ASX200. This shows that both returns are very similar. Armed with above data it seems reasonable for the type of analysis this regular post addresses the MSCI Australia can be used as a proxy for the ASX200 when it comes to Dividend Yield and P/E Ratios. This dataset will therefore continue to be run as it was prior. Please do however make your own mind up in view of what I have discussed above. The ASX 200 Price at market close on Wednesday was 4,506 which is up 2.7% from last month’s Price of 4,387 and up 4.8% year on year. The MSCI Australia (now the proxy for the ASX200) Dividend Yield is currently 4.8%. The ASX 200 Earnings (calculated using MSCI Australia P/E Ratio and ASX 200 Price) are currently 328. The MSCI Australia (now the proxy for the ASX 200) P/E Ratio is currently 13.7 compared with the a dataset (since December 1982) average P/E of 18.3. The chart below shows a historic view of the Real (inflation adjusted) ASX 200 Price and the ASX 200 P/E. 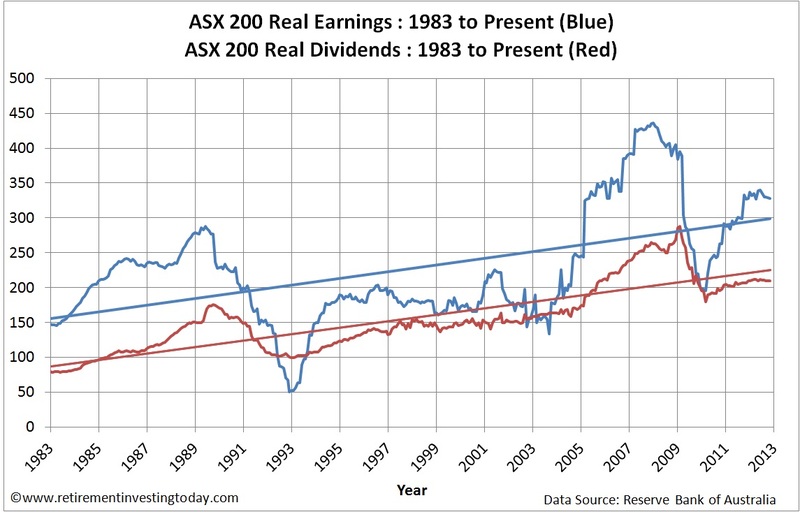 The second chart below provides a historic view of the Real (after inflation) Earnings and the Real (after inflation) Dividends for the ASX 200. The first chart above also shows a historic view of the metric that this post is interested in, which is the ASX 200 PE10 (effectively an ASX 200 cyclically adjusted PE or ASX 200 CAPE for short). The method is based on that made famous by Professor Robert Shiller and in this instance it is simply the ratio of Inflation Adjusted Monthly ASX 200 Monthly Prices to 10 Year Inflation Adjusted Average Earnings. ASX 200 PE10 is currently 14.9 which is above last month’s 14.6. 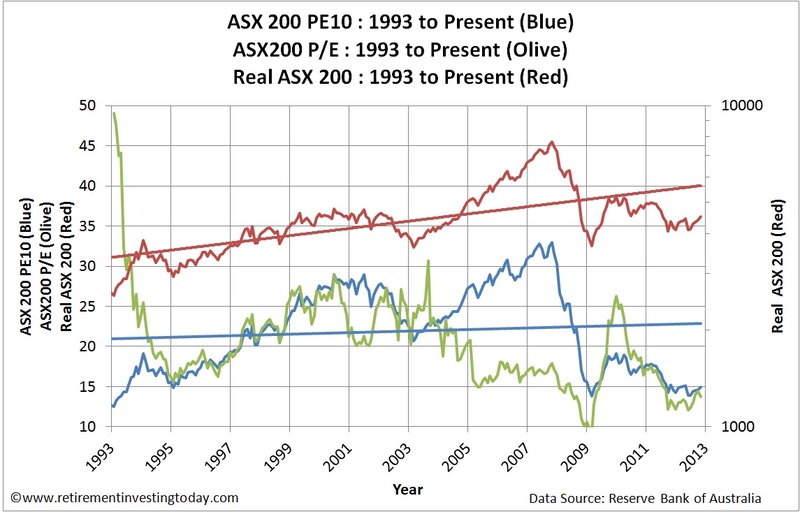 The Dataset Average ASX 200 PE10 is 21.9. If this average was “fair value” then it indicates that today the ASX200 is 32% undervalued. I’m not convinced of this though and think it is a result of a relatively short dataset but as usual I’ll cover that later in this post. The Dataset Median ASX 200 PE10 is 22.1. The Dataset 20th Percentile ASX 200 PE10 is 16.7. Dataset 80th Percentile ASX 200 PE10 is 27.5. 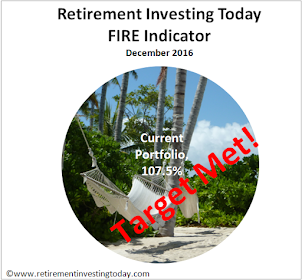 My final chart below shows why I use the ASX200 PE10 ratio as part of the tactical portion of my Retirement Investing Today strategy. This chart shows the ASX200 Price vs the Nominal 5 Year Total Return. The correlation is -0.51 with an R^2 of 0.26. With the ASX200 PE10 at 14.6 the chart trendline implies a future Nominal 5 Year Total Return of 85%. Even if I adjust this metric for inflation (not charted today) the trendline implies a real return of 67%. Finally, one problem this data has is that it is quite a short set. For my own investments I therefore now try and correct for this by making quite a large assumption, which is that there is a high correlation between Australian Equities and International Equities performance. With this assumption I then look at my mature S&P 500 dataset which tells me that since 1881 the average PE10 has been 16.5 and from 1993 it has averaged 26.5. 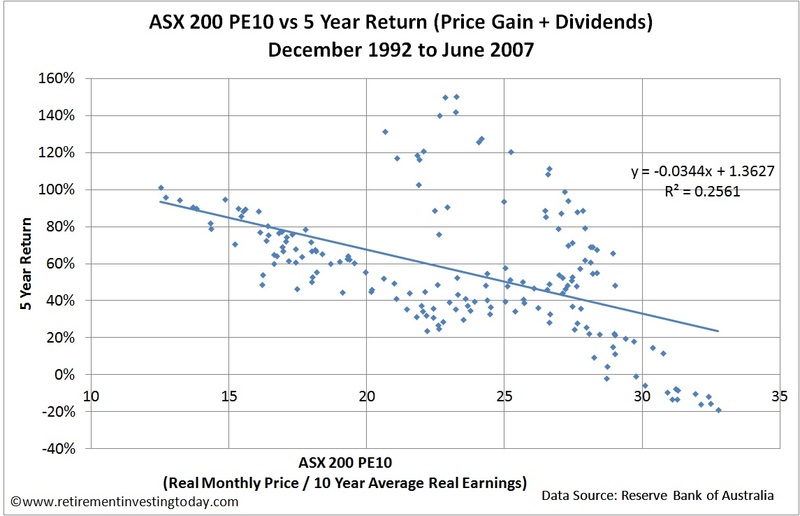 Taking a ratio of these two PE10’s and multiplying by the current ASX200 Average PE10 I arrive at a “pseudo long run” Average PE10 of 13.6. Comparing that with today’s PE10 of 14.2 suggests the market is now slightly over valued and it is that data that I am making my own personal investment decisions on. Latest P/E ratio is calculated using the 24 October 2012 Price and the September 2012 Earnings which is extrapolated from the RBA’s published P/E. October 2012 Price is the 24 October 2012 market close. October 2012 Earnings and Dividends are assumed to be the same as the September numbers. Inflation data for July to October 2012 is extrapolated. I think, this is the way to look at the markets, if you are a long term investor, as apposed to a trader (w....r). it is smple to asses the relative values of other asset classes using this strategy. Diversification will never be replaced as a risk reduction strategy though. 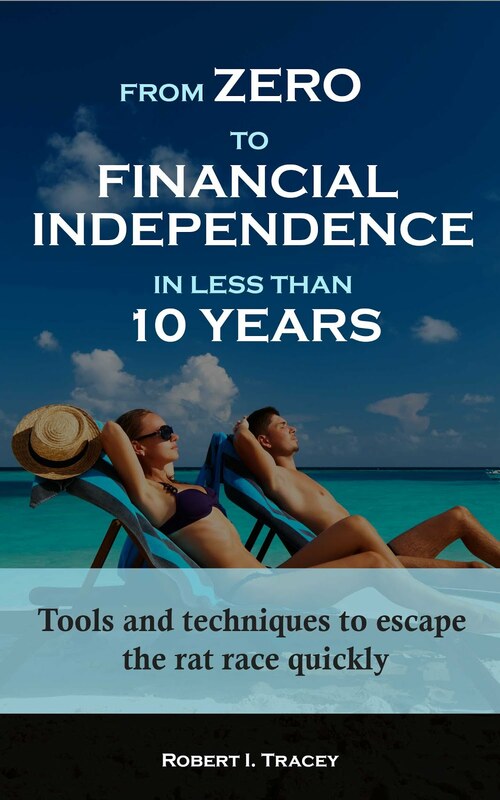 This can help you make long term investment weighting decisions. Compare stock market PE10 14.2 to the property PE10 of around 28. I know which investment i want to hold.